The UNC Health Care Hospitals, featuring the NC Women’s Hospital (middle building). Photo courtesy of UNC Health Care and UNC School of Medicine Newsroom. The Dogwood Deck is located on Manning Drive across from UNC Hospitals. 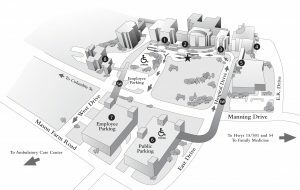 Mapping and directions are available from the the searchable UNC Campus Map (search for “dogwood”).Patients and visitors may park in the Dogwood Parking Decks or the Ambulatory Care Center parking lot at a cost of $1.50 per hour or a fraction thereof, to a maximum of $8 for a full day. Parking for patients visiting the UNC Family Medicine Center is located directly beside the front entrance of the center.